Summary: My friend Maryam and I decided to see if we could take photos of her holding burning flowers. It required some logistics and some planning, but the results were fairly stunning. 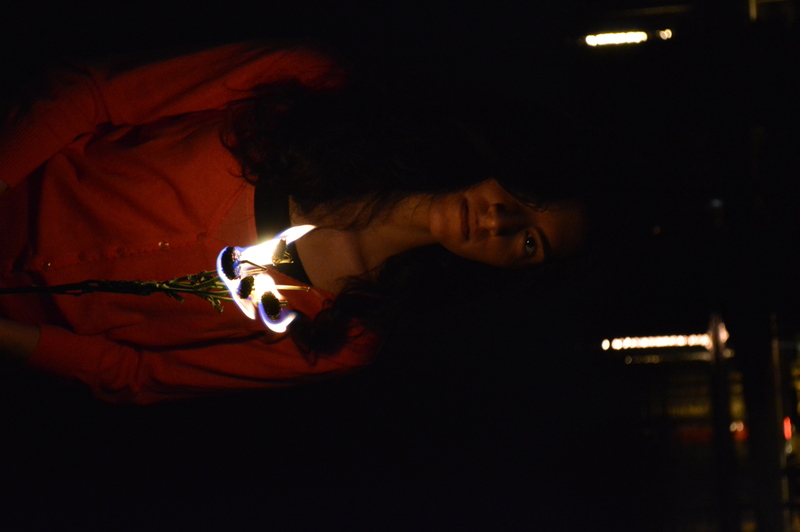 Maryam had an interesting idea not terribly long ago, she wanted a set of photos taken where she was holding a flaming flower. 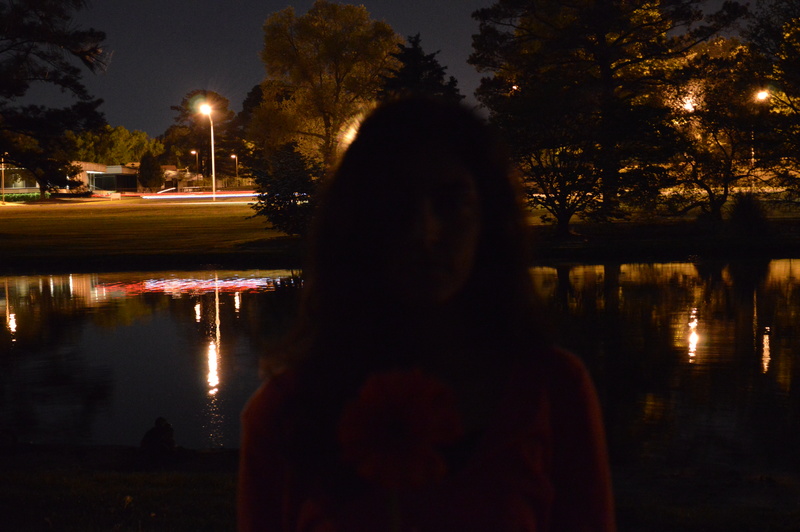 She got the idea from an Avril Lavigne music video [skip to about 40 seconds in], with the added twist that Maryam wanted it shot against a fairly dark night. We spent a day or so thinking up the logistics, trying to look up some ideas about how to actually safely set flowers on fire without them being dried. This past Monday—the night before her birthday—we had enough of an idea to set the plan in motion. Since taking photos with flaming flowers seems like something other people might want to try, here is some notes about our experience. One of our first concerns was definitely safety. 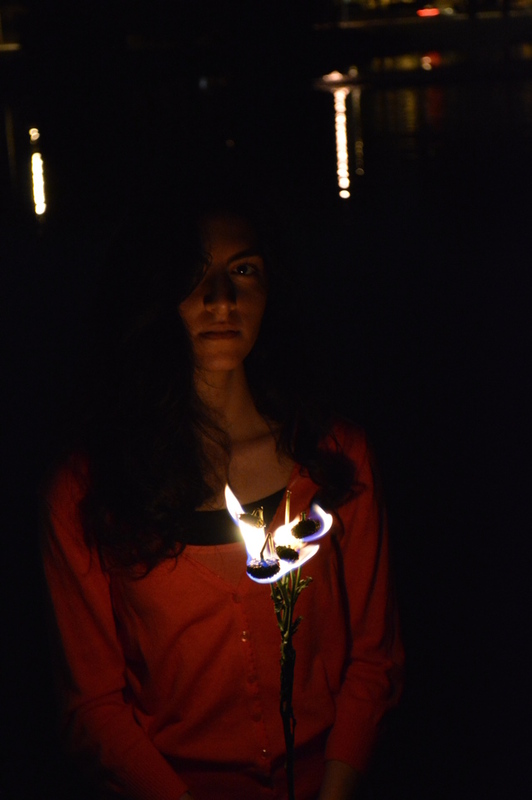 We weren't sure how safe it would be to hold a flower that was burning, and we definitely did not want to risk her catching her hair on fire, or burning her hand. I was pretty sure that Zippo lighter fluid would work just fine, and would be something we could fairly control by adding a small amount at a time until we got the hang of how long and how hot it would burn. We rigged up a tall glass jar with aluminum foil wrapped in several layers across the top, with a hole big enough to hold the flower, that way if the test shots decided to burn down the stem, it would hit the foil and not cause any damage to use or the area around us. We also used one of those longer lighters you light barbecue grills with. And shot the thing close to water so just in case it went pear-shaped, we could basically dump the burning flower (or ourselves) to put out the fire. we picked up a bouquet from Publix that had a mix of flower types, so we had variety, and got to experimenting. Our first attempt was a fair success, though it burned fast. What we found is that the flowers burned better a second time after they had been slightly dried by the initial heat, so we took the rest of the flowers out of the bouquet and let them dry out just slightly—had to recharge my camera, anyhow, so that hour or so downtime of getting the charger and the tripod equipment and letting it charge gave the flowers more time to dry and the night to get darker. 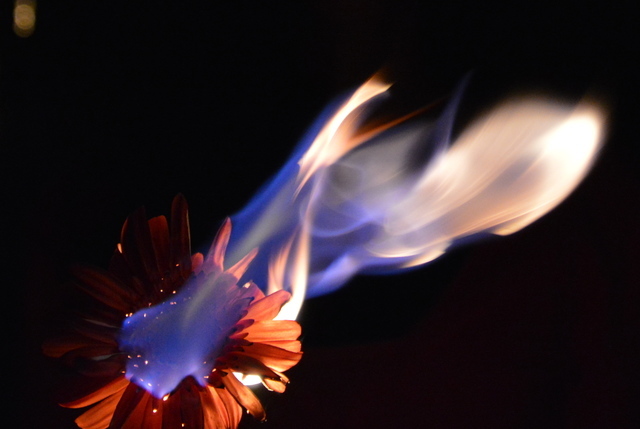 We also discovered that you need to use more lighter fluid than feels like a reasonable amount, but the natural shape of the flowers does a good job of holding the fluid in. Around this time, I did a lot of test shots in the dark testing with and without flash, longer and shorter shutter speeds, further and closer shots. Got the hang of what it would look like as I went. Then we basically just got to work. 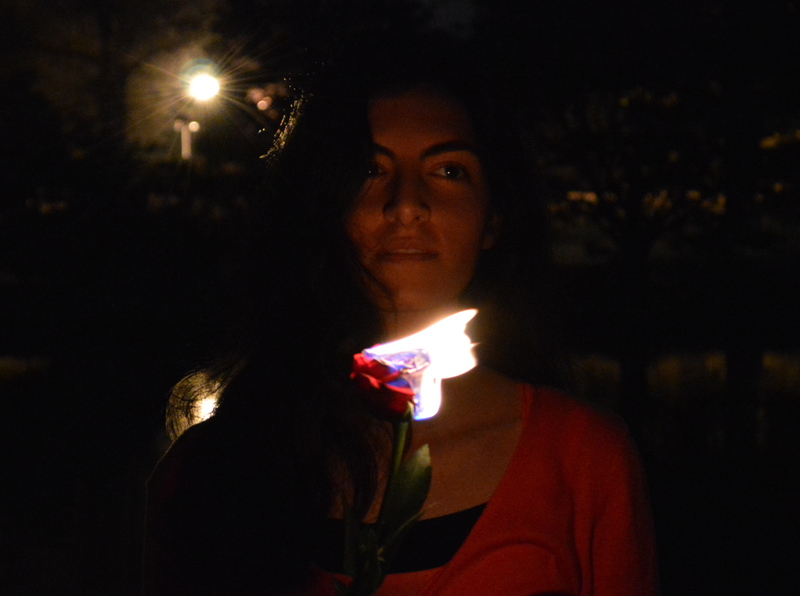 We would light the flowers one by one, take a number of photos, then restage for the next shot. 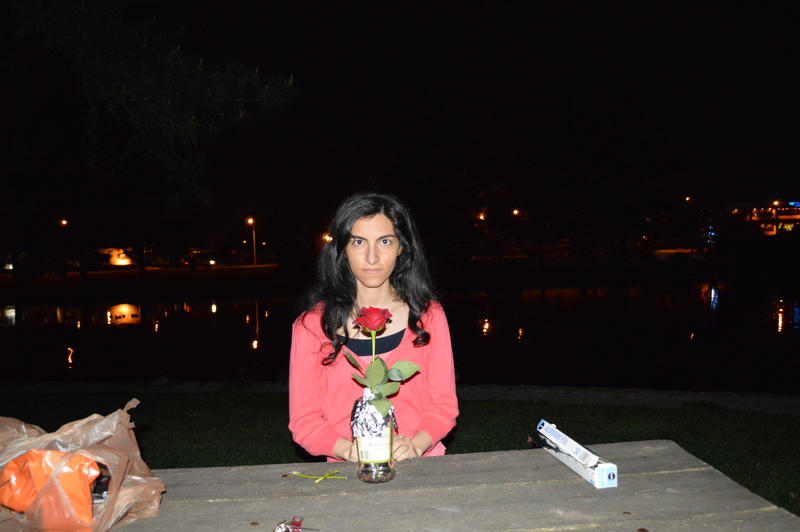 After the first couple in the jar were deemed safe, we moved on to holding the flowers. 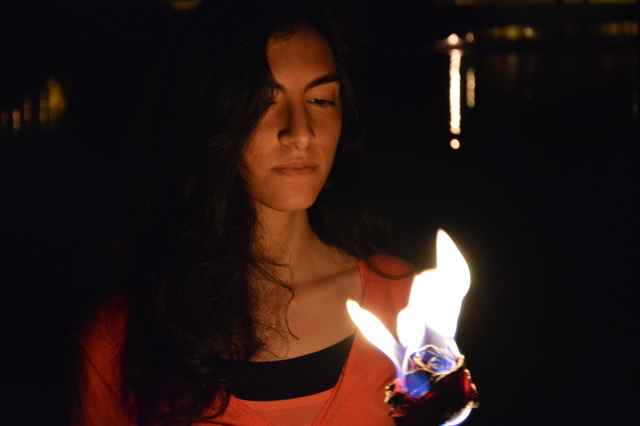 I did the initial test of this, but once we found out that it was perfectly safe as long as you used caution and were aware of wind blowing the flame around, we let her do the holding from then on out. All told, we took 170 or so photos that night, and then I chose 70 I thought would work, and she chose about 25 from that list with some notes about what sort of edits she would like [I did things like cropping and some mild touch ups to color to help her and the flowers pop from the dark background]. 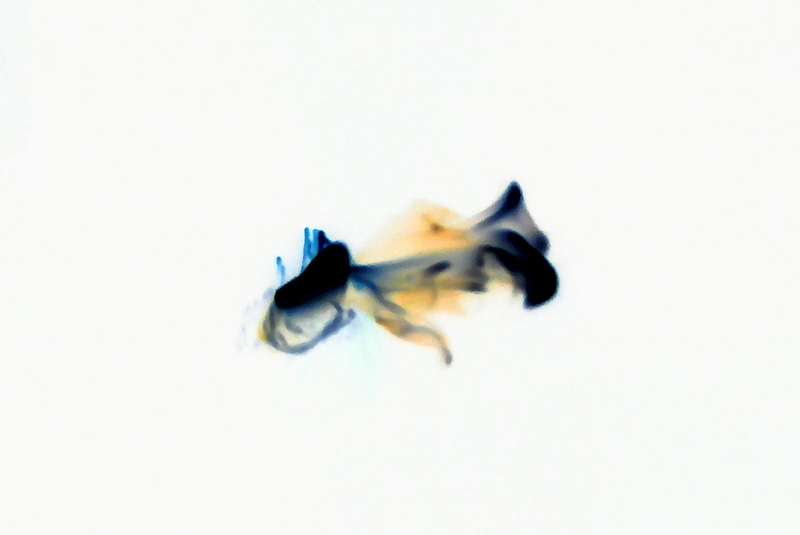 I've included four of her choices, the top one and three below, and then added a couple of behind the scenes shots and one, the last one, where I digitally isolated the flame and tweaked it so that it sort of shows the intensity of the flame at any given spot [the darker the color, the bright the flame was] to this post. This is a sample, and some of the more impressive pictures from the night, but we might find a way to make the rest more public as we go.